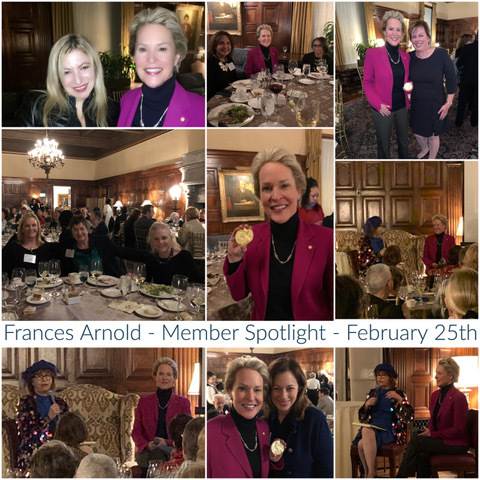 As reported by Trusteeship member, Ilyanne Morden Kichaven, the Frances Arnold Member Spotlight was a phenomenal experience. 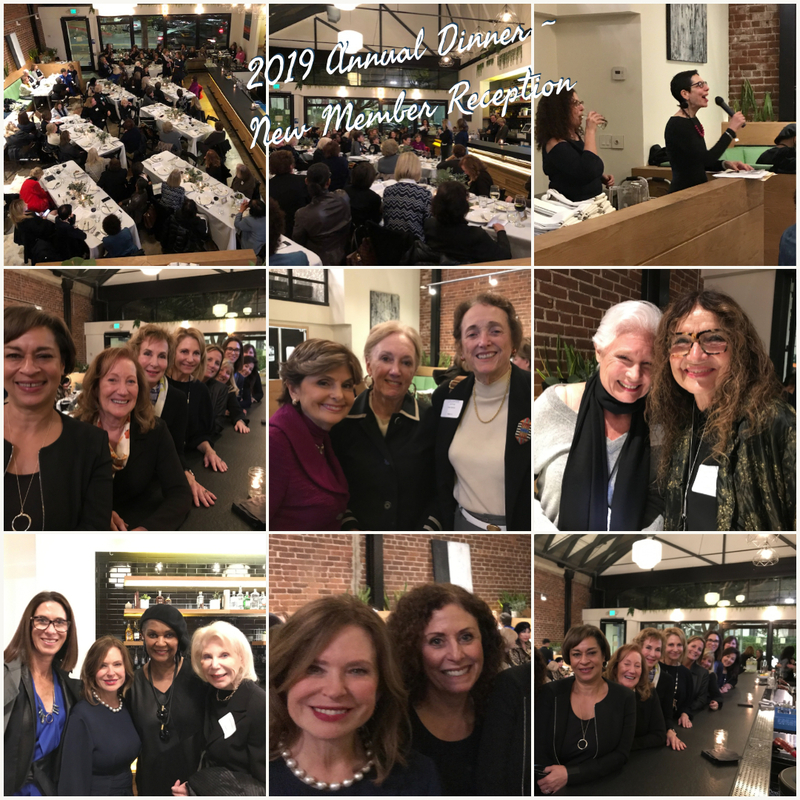 Ilyanne shares: 55 Trusteeship members and 23 guests witnessed a very special evening on Monday, February 25th to celebrate our own, Nobel Prize Laureate, Frances Arnold. Our elegant dinner at Caltech’s famed Athenaeum was followed by a brilliant interview with Frances by fellow Trusteeship member, Emmy and Pulitzer award winning journalist, Patt Morrison, who became friends with Frances through The Trusteeship and traveled with her to the Stockholm Nobel festivities. Frances recounted her remarkable journey from her first days as a scientist to the awards prentation on December 10, 2018 and dining with the King of Sweden, His Royal Highness, Carl XVI Gustaf and what has transpired since. Frances, the Linus Pauling Professor of Chemical Engineering, Bioengineering and Biochemistry, won the 2018 Nobel Prize in Chemistry for “the directed evolution of enzymes”. Directed evolution, pioneered by Frances in the early 1990s, is a bioengineering method for creating new and better enzymes in the laboratory using the principles of evolution. Today, the method is used in hundreds of laboratories and companies that make everything from laundry detergents to biofuels to medicines. Enzymes created with the technique have replaced toxic chemicals in many industrial processes. Always looking beautiful Frances exhibited little more glamour as she filmed a small part on an episode of The Big Bang Theory that day, playing herself, and was in full hair and make-up from the set (Look for Frances on the April 4th episode of The Big Bang Theory). Frances is the fifth female chemistry laureate since the prizes first began in 1901, and the only American woman to ever win in the subject. At evening’s end she brought out the coveted medal and took photos with her Trusteeship sisters so we could share the glory. All were in awe to be in the company of the highest order. Heartfelt congratulations to Frances who changed the world! The reviews are in and the results are: Fabulous Evening! Taking a twist to our standard ceremony of introducing our new members, President, Karen Caplan, and Membership Chair, Miriam Muscarolas, let us all get acquainted with our newest members by asking each two questions. Each was asked, “what was your first job?” and then each was asked a separate, fun question….and hearing the responses in our new member’s own words was not only fun, but a great way to share in their own personal warmth and voice. A fun new process will will indeed repeat in years to come! The evening also shared a running slideshow of the 2018 events photo collages as well as a slide show of individual mentions and details on all of our new members…all 15 of them! All Trusteeship members were invited to The Annual Holiday Parties! 109 members participated this year, which is a record in membership involvement. 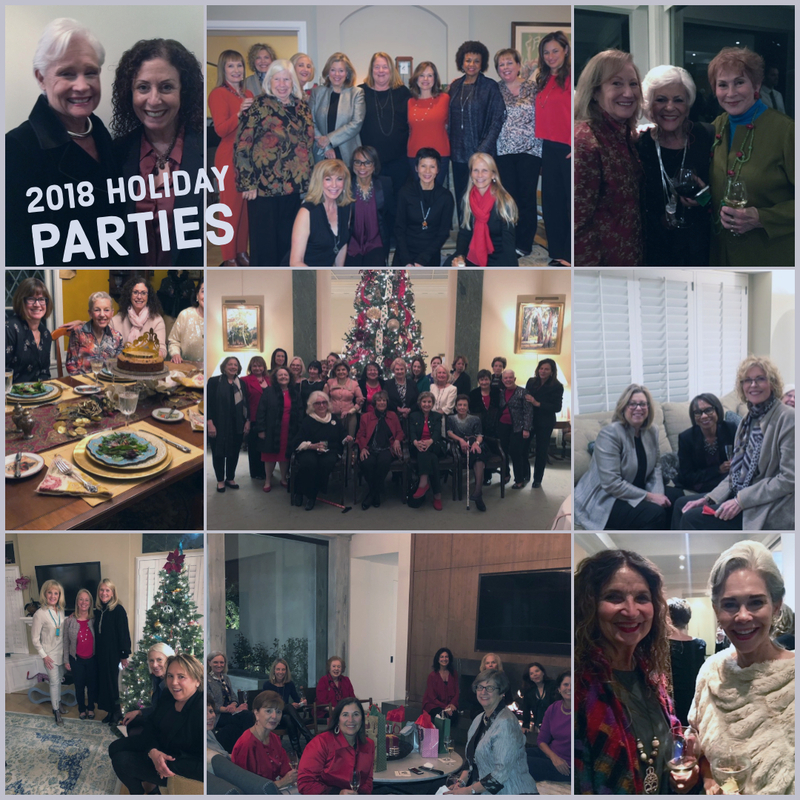 The Trusteeship Holiday Parties were intimate gatherings with fellow members and all could select one party our of the eight different parties offered. All had a great time reconnecting and taking part in the holiday festivities. Opera adventurers gathered at Trusteeship member Beth Morrison’s eclectic loft in DTLA’s Arts District for wine, food, and thought provoking discussion prior to heading to the Redcat theater for the premier of the riveting new opera – Prism – part of LA Opera’s Off Grand Series, produced in partnership with Beth’s company, Beth Morrison Projects. Given that, since 2006, Beth Morrison Projects has been an industry disruptor at the forefront of musical and theatrical innovation by commissioning and producing groundbreaking new works by living composers, members anticipated an amazing out-of-the box experience. And, Prism did not disappoint. It was a highly emotional experience – shaking you to your very core, reported Billie Greer, who attended along with members Diane Ingram, Kathleen Brown, Jennifer Ferro, Wendy Garen, Paula Holt, Beth Morrison and Martha De Laurentiis. Composed by the extraordinarily talented Ellen Reid, the opera focuses on a young woman’s struggle with the aftershock of sexual assault that leaves her in a near-catatonic state and her excruciating journey to take back her life. Earning rave reviews, Prism will be performed in New York early in the new year, as part of Beth’s Prototype Festival, which showcases numerous contemporary opera and music theater projects. 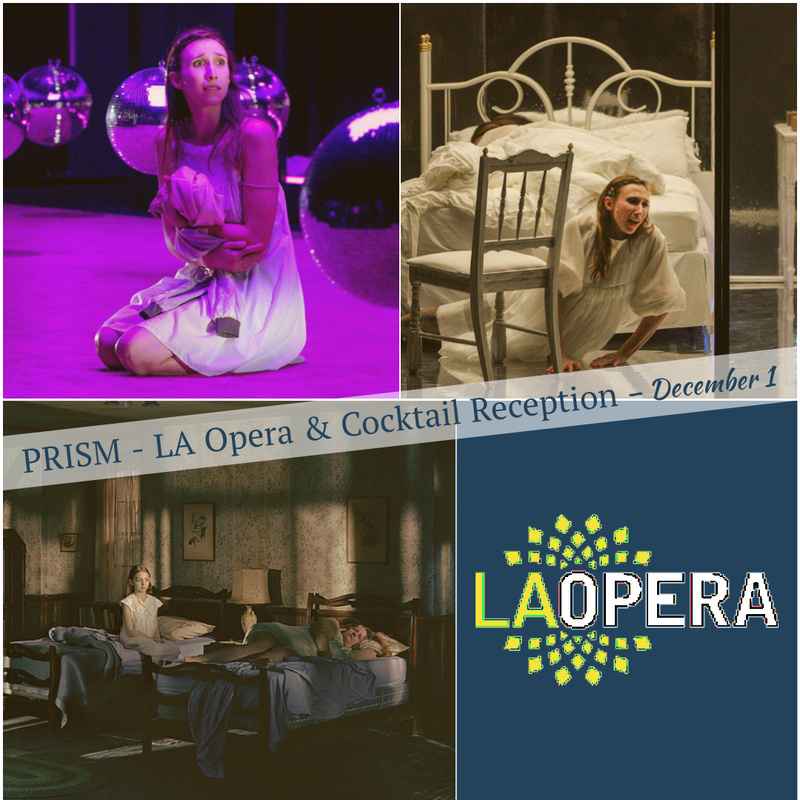 So if you missed Prism in LA, see it in NYC in January and let Beth know you’re coming. The reviews are in and are smashing! 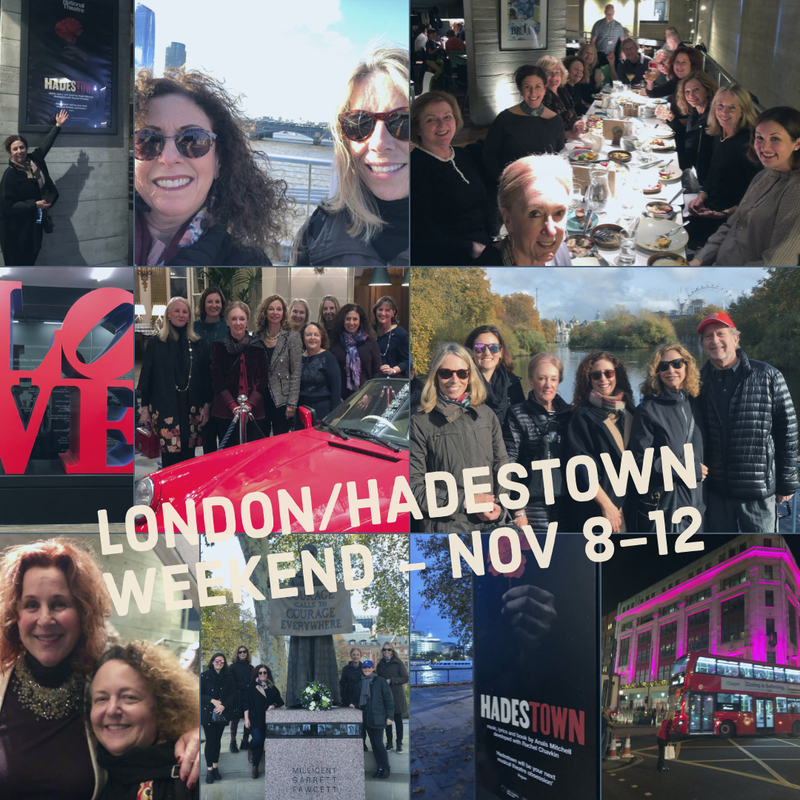 A group of eight Southern California Trusteeship members and some of their friends enjoyed a whirlwind excursion to London, England where the focus of the trip was catching the pre-release show of member Dale Franzen’s Hadestown! 10:00 am Private tour of the Victoria and Albert Museum in South Kensington and walk up to Royal Albert Hall. Kensington Gardens – depending on the weather more or less time with be outside on the walking tour. Harrods Early afternoon tea at 1:00 pm at Laduree. Dine-A-Round at the Royal Automobile Club 7:00 pm. Enjoy a glass of bubble in the Champagne Room before dining in the Brooklands Room for a 3 course dinner. 10:00 am Suffragette’s Walk – The tour aims to give a general overview of the suffrage movement (100 year anniversary of all women receiving the right to vote), telling the stories and taking some of the locations associated with the campaign in the Westminster area. The tour will extend towards St. James Park, The Mall and Buckingham Palace – 2 hours. Meet by the statue of George Washington outside the National Gallery on Trafalgar Square. Alice will be your guide. 1:45 pm: Thames River Cruise. This event is very near the hotel so you can walk or take a taxi. Dinner: 5:30 pm – The Terrace – National Theatre. You can either walk or take a taxi to the National Theatre. Your reservations are for 5:30pm sharp so please leave time to get to the theater. You may either walk or take a taxi. 7:30 pm London pre-launch performance of “Hadestown” at the National Theatre. We loved having you all here! Thank you for coming. It was a treat to meet / see you. I hope you have been safe from the destructive and devastating fires. Hadestown was fantastic – a huge hit!! And it was such a thrill to see it in London with the producer Dale Franzen and fellow members of the Trusteeship. Wonderful to share London and Hadestown with y’all! It was such a fun, exciting weekend and such a pleasure to get to know the great women who attended. Len and I were knocked out by Hadestown and couldn’t agree more with the rave reviews. Our walking tours were wonderful…so much so that we hired our guide, Rachel Pearson, for a private tour later in the week. Kathryn did an incredible job arranging and hosting us. We loved spending time with Kathryn, Mark and the rest of the London crew. Thanks so much for all of the planning, Julie and thanks to you great women for exploring London with us.